So many times in life you come to a crossroads. Where you often find yourself wondering. And I think today I find myself thinking those words out loud. I'm sitting in my cushy new office. That is really only about a week old. I look around the room and see Play-Doh...Dinosaur Train..Aurora's Birthday Party toys. Toys are seriously lining the walls. I guess you could say I have a 'Toys Eye View'. And yes. My 3 year old might be deprived. That luckily, all of these 'things' have a place. 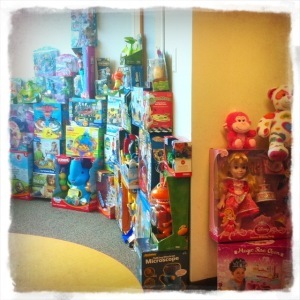 These toys are going to Cradles to Crayons for children in Philadelphia who don't have anything. I'm not sharing this with you because I want you to think I'm 'cool' or special. Or awesome for that matter. I've honestly had these toys for YEARS since I started blogging. Fortunately they are out of the garage and into my eyesight to remind me of how lucky I really am. Or to remind me that I am enough. Cause there is some little child or mother out there...struggling to make it in this world. My little 'dream' is becoming a reality. And my little 'dream' when I was in my 20s was to be on the radio - - became a reality. And the BIG THING that the two have in common? To look in the mirror and realize... I.AM.ENOUGH. I've been struggling with myself (yes...AGAIN) the past few weeks. Mainly because I'm dreaming for a husband that isn't crazed with sports that can notice me. Or looking for some kind of simple recognization from SOMEONE. I notice when good things are happening. And I don't need someone to verify that.